drbd – More Mind Spew-age from Harold Spencer Jr.
High availability for applications and physical machines is key to having services “appear” to never be down. With cloud computing, deploying failure resilient applications is needed for services that need to be always available. The purpose of this blog is to provide more of the technical information for HA Open iSCSI that good friend and colleague, Lester, mentioned in his blog. Our goal was to setup HA with Open iSCSI without access to a SAN. To accomplish this, we used Pacemaker, Open iSCSI, and DRBD. The great guys from Linbit provided us with the documentation to deploy this environment. 2 Machines (for HA active/passive setup), 1 NIC (1 Gigbit) per machine, CentOS 5.7 x86_64 (kernel 2.6.18-274.18.1.el5) running on each machine. The installation instructions are pretty straight forward. The instructions will be the same for both machines – unless otherwise noted. These instructions assume that CentOS 5.7 has already been installed. If CentOS 5.7 is not already installed, please go to the CentOS 5 Documentation for installation instructions. In order to configure DRBD, we need to create and edit a resource file clustervol.res under /etc/drbd.d on both nodes. One thing to note here, we used a separate device (/dev/sdd2) that uses LVM to be utilized by DRBD (for syncing the content served up by tgtd). We did this to make it easier for recovery of disks in case of failure. For performance gains for disk syncing and failover responsiveness, DRBD can be configured to match those needs. For more information on configuring DRBD, please refer to the sections Configuring DRBD and Optimizing DRBD performance of the DRBD 8.3 User’s Guide. This document is a *must have* as a reference source. I suggest reading it and trying out different configurations before putting any service using DRBD in a production environment. 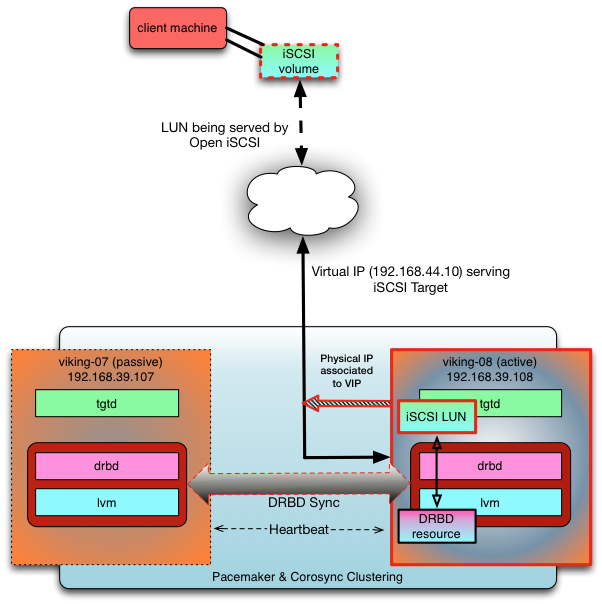 For our setup, we configured a DRBD resource as a Physical Volume, as as described in the documentation provided by Linbit. For more information concerning using LVM with DRBD, please refer to section entitled Using LVM with DRBD in the DRBD 8.3 User’s Guide. We need to make sure to instruct LVM to read the Physical Volume signatures from the DRBD devices only. After this is done on both nodes, we need to create an LVM Volume Group by initializing the DRBD resource as an LVM Physical Volume. In order to do so, creation of the metadata for the resource is needed. Our resource name is clustervol. Pacemaker is a cluster resource manager which handles resource level failover. Corosync is the messaging layer which handlers node membership in the cluster and node failure at the infrastructure level. For more information on how to use the crm shell, please refer to the CRM CLI (command line interface) tool documentation provided by clusterlabs. A DRBD resource to replicate data. This is controlled by the cluster manager by switching between the Primary and Secondary roles. The target contains the Logical Unit with LUN1, mapping to the Logical Volume named lun1. op monitor interval="10s" timeout="30" depth="0"
For information concerning addressing any security considerations for iSCSI, please refer to the section entitled Security Considerations in the document Highly Available iSCSI Storage with DRBD and Pacemaker, provided by Linbit. The Pacemaker default for the resource group is ordered and co-located. This means resources contained in the resource group will always run on the same physical machine, will be started in the same order as specified, and stopped in reverse order. For more information about adding a DRBD-backed service to the cluster configuration, please reference Adding a DRBD-backed service to the cluster configuration in the DRBD 8.3 User’s Guide. The status of the cluster reflects the diagram at the beginning of the blog. We are ready to access iSCSI. Login to [iface: default, target: iqn.1994-05.com.redhat:cfd95480cf87.clustervol, portal: 192.168.44.30,3260] successful. For more information on connecting to iSCSI targets, please refer to the section entitled Using highly available iSCSI Targets in the document Highly Available iSCSI Storage with DRBD and Pacemaker. Now the only thing left is to format the device. For this exercise, we just used XFS. Once thats completed, we mounted the device a mount point. Our mount point is /mnt/iscsi_vol. A more complex test is to do an md5sum of a file (e.g. an ISO) and copy it from a desktop/laptop to the machine that has the iSCSI targeted mounted (e.g. viking-09). While the copy is happening, you can use the crm CLI to failover back and forth. You will see there is no delay. You can monitor the status of the cluster by using crm_mon. After the copy is complete, do an md5sum of the ISO on the machine to where it was copied. The md5sums should match. The next phase of this blog will be to script as much of this install and configuration as possible (e.g. using Puppet or Chef). Stayed tuned to more information about this. Hope you enjoyed this blog. Let me know if you have questions, suggestions, and/or comments.